7 Inch Mirror and a 120 Degree Double Mounted Wireless RV Backup Camera Great for RV's, Trailers, and Trucks! By using the “CUSTOMIZE AND UPGRADE” section at the top right of the page, you can choose which style of backup camera fits your needs and budget. This system comes preconfigured with 2 cameras however, we have different styles for all kinds of uses. Change 1, both or none of the cameras in this system, the choice is yours. Please use this guide to help you select which camera is best for you. The RV Double Box camera has a 120° Degree viewable angle, it's waterproof and has auto night vision. 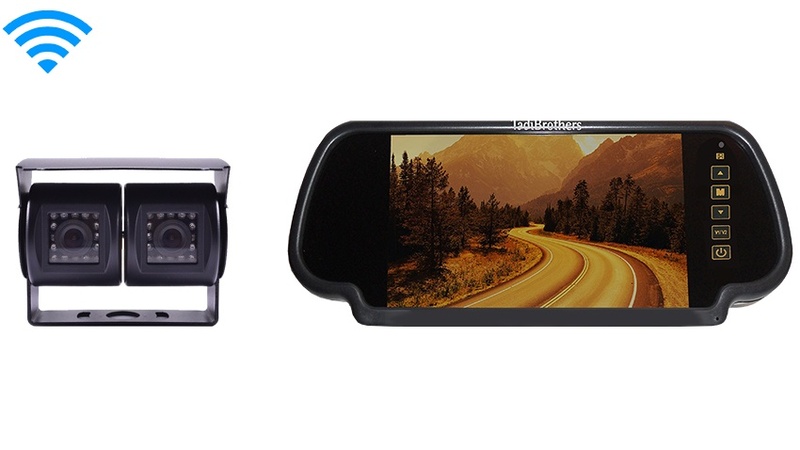 This double camera allows you to use it for multiple viewing angles. Point one camera at your hitch and one at the road behind you. Then, using our monitor, you can switch between the cameras using the Video 1 and Video 2 button.